I am a day late for Tutorial Tuesday. I had a sick, throwing up child to take care of instead of blogging! 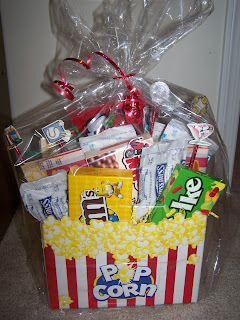 A couple of years ago, my sister wanted to give a movie gift basket as christmas presents, but online they are kinda pricey. So she decided to try and make her own. Well, this sister is not very crafty, so she asked for my help. 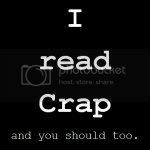 Now my other sister and I have stolen this idea from her (thanks Marjory!) 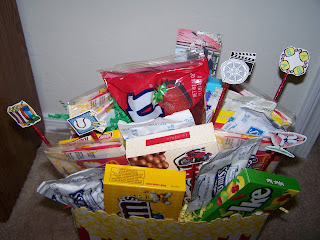 and I wanted to do a Tuturial Tuesday on how to make these gift baskets. I really like them and they are cheaper than the ones you buy online...which is always nice! 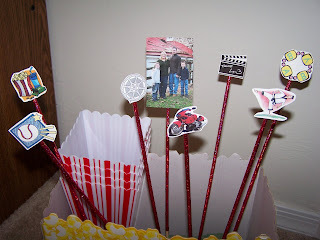 And I love how I can personalize the gift basket to each family that I am making it for. 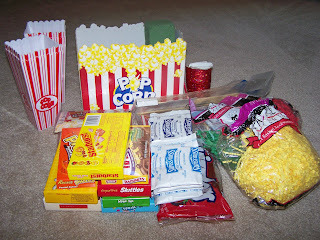 First, I got everything that I needed to make the movie basket. -Blockbuster gift card or movie or even a netflix gift certificate or whatever you want! 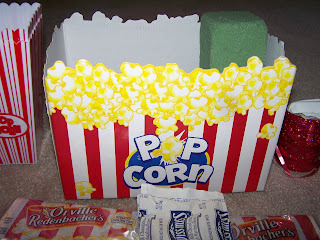 I put the popcorn tubs and green stuff in the box first. 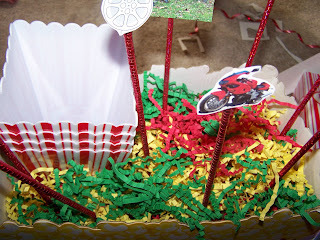 I like to embellish the gift basket a little and make it a little more personal. 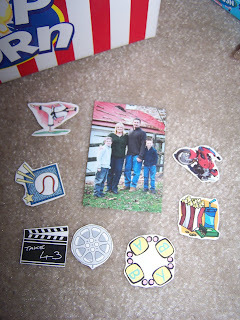 So I printed out some clipart on cardstock that has to do with the family. Cut that out. I have never done this before, but I didn't want to leave my bamboo sticks just plain, so I decided to wrap red ribbon around all of them. 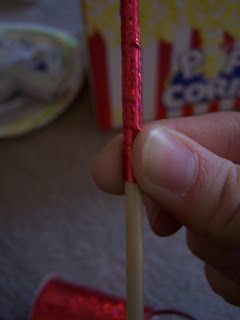 Then hot glue the cut out clipart to the ends of the bamboo sticks. 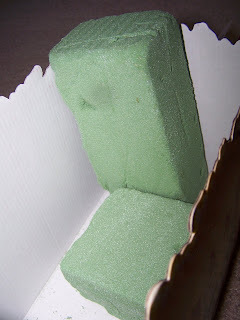 And stick it in the green stuff in the box. 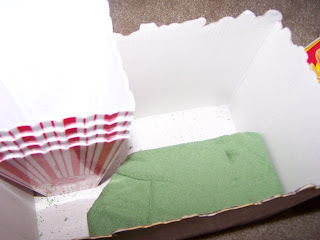 Then I put the filler stuff in and filled it to the top of the box. 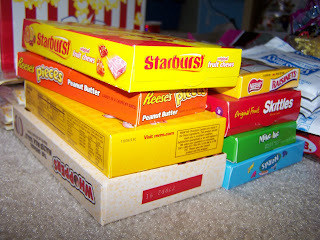 And now the fun part...shoving all the candy, popcorn, and hot chocolate in the box. I have never made a box that is so full. But, I managed to fit it all in!! And don't forget to add the gift card or whatever. I still need to buy mine so it is not in there yet! Great idea! 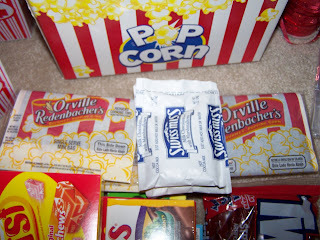 Can I ask where you got the Popcorn basket you put this all in? Hey Our 2little Lady Bugs! 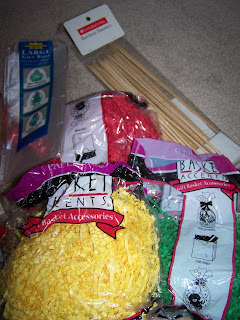 I ordered the boxes from www.nashvillewraps.com. 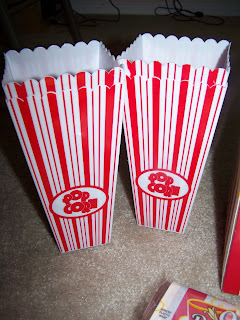 You can search for popcorn box on the site. And the one I used, is the large size. Great idea! I think the green foam is called florist or floral foam. This is the cutest idea. Christmas idea or even a good Father's Day gift! Thanks for the neat idea. I just may have to use it for someone special. 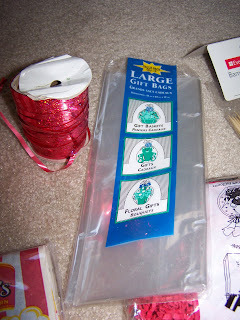 Another giveaway from Vanilla Joy! !